Our work deals with the self-organization  of a memory structure that includes multiple hierarchical levels with massive recurrent communication within and between them. Such structure has to provide a representational basis for the relevant objects to be stored and recalled in a rapid and efficient way. Assuming that the object patterns consist of many spatially distributed local features, a problem of parts-based learning is posed. 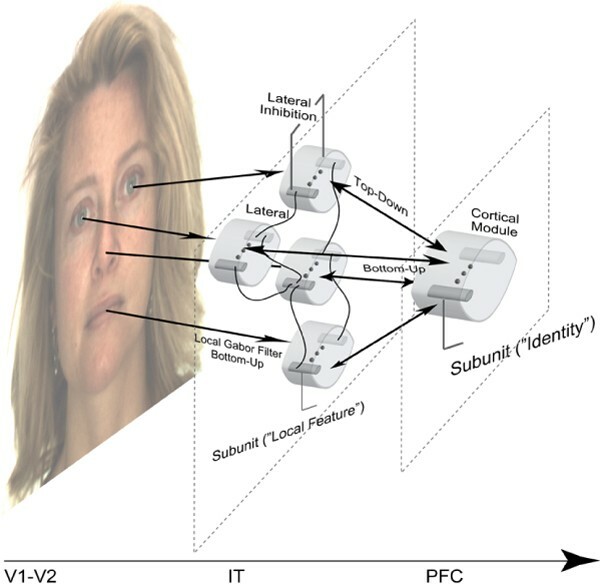 We speculate on the neural mechanisms governing the process of the structure formation and demonstrate their functionality on the task of human face recognition. The model we propose is based on two consecutive layers of distributed cortical modules, which in turn contain subunits receiving common afferents and bounded by common lateral inhibition (Figure 1). In the initial state, the connectivity between and within the layers is homogeneous, all types of synapses – bottom-up, lateral and top-down – being plastic. During the iterative learning, the lower layer of the system is exposed to the Gabor filter banks extracted from local points on the face images. Facing an unsupervised learning problem, the system is able to develop synaptic structure capturing local features and their relations on the lower level, as well as the global identity of the person at the higher level of processing, improving gradually its recognition performance with learning time. A model of layered visual memory. The structure formation relies on the activity-dependent bidirectional plasticity  and the homeostatic regulation of unit's activity. While these occur on the slow time scale, the fast acting neural dynamics with strong competitive character ensures that only a small subset of units may update their synapses during a decision cycle spanned by oscillatory inhibition and excitation in the gamma range. This repetitive selection triggered by certain face images leads to amplification of the memory trace for the respective person. Acting together, homeostatic constraint and bidirectional plasticity work on reducing the overlap between different memory traces, segregating them in the memory structure. The ongoing modification of the memory's structure conditions the system for more and more coherent communication between the bottom-up and top-down signals. The binding of the local features via lateral and top-down connections into a global identity enhances the generalization capability of the memory, and renders the system to reliably recognize novel face images of different views not presented before. The proposed mechanisms of learning reveal thus basic principles behind the self-organization of successful subsystem coordination. This work was supported by the EU project DAISY, FP6-2005-015803.